OPEC cancels April meeting, effectively extending output cuts until June. U.S. sanctions against oil producers Iran and Venezuela are also boosting prices. Rising U.S. production and economic slowdown weigh on prices. Oil prices were little changed after hitting 2019 highs on Tuesday, maintaining recent strength on the back of expectations for OPEC to continue production cuts. U.S. oil prices have climbed 9 percent in the last six weeks, as the supply cuts are now expected to continue through the rest of 2019. OPEC canceled its April meeting this week after a shorter get-together in Azerbaijan. 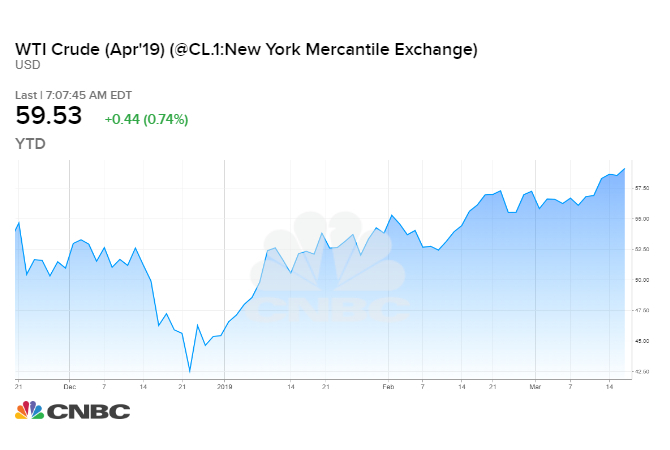 U.S. West Texas Intermediate futures for April delivery ended Tuesday's session 6 cents lower at $59.03 per barrel, after hitting an intraday peak at $59.57, the highest level since Nov. 12. The April contract expires on Wednesday. The more heavily traded May contract nearly hit $60 a barrel on Tuesday. Brent crude oil futures rose 7 cents at $67.61 per barrel. The international benchmark for oil prices rose to a four-month high at $68.20 earlier on Tuesday. "Some people might consider that there's a rift between Saudi Arabia and Russia over the postponement of this meeting, resulting in supply cuts not occurring as fast as the market would like," said Andy Lipow, president of Lipow Oil Associates in Houston. "However, I think OPEC and non-OPEC producers are determined to get the supply and demand dynamics better into balance, recognizing that U.S. shale production is going to continue to rise." OPEC and a group of non-affiliated producers including Russia, known as OPEC+, cut supply in 2019 to halt a slump in prices that began in the second half of last year on booming U.S. production and fears of a global economic slowdown. Prices have been further supported by U.S. sanctions against oil exports from Iran and Venezuela. Because of the tighter supply outlook for the coming months, the Brent forward curve has gone into backwardation since the start of the year, meaning prices for immediate delivery are more expensive than barrels for delivery in the future. Analysts are also waiting for weekly figures on U.S. crude oil production, which has risen by more than 2 million barrels per day since early 2018, to about 12 million bpd. The American Petroleum Institute, an industry group, releases its figures at 4:30 p.m. EST (2130 GMT), followed by the U.S. government's official figures on Wednesday.